Q*bert is a 1982 video game developed by Gottlieb. Warren Davis and Jeff Lee co-developed Q*bert and gave him a long nose so that he could shoot projectiles. Fortunately, the shooting aspect of the game was dropped and Q*bert became the lovable character that we all know. In fact, Q*bert was the third most merchandised game, after Donkey Kong and Pac-man. 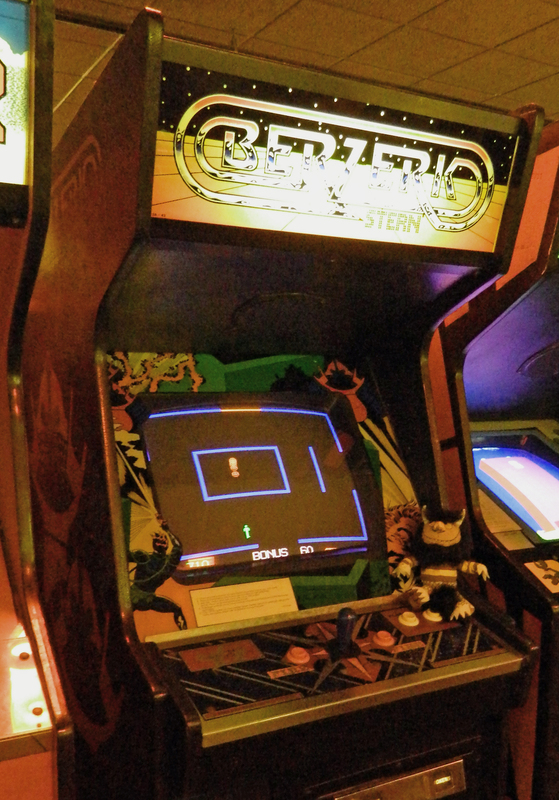 Q*bert was a major hit for Gottlieb with more than 25,000 arcade units sold. It was offered as both an upright cabinet and a cocktail table. The cocktail table units are fairly rare as only a few hundred were manufactured. The Q*bert arcade units were powered by an Intel 8086 cpu and had mono sound and used a standard 19” CRT. Q*bert was ported to a number of home consoles of the era including the Atari 2600, & 5200, the Colecovision, the Intellivision, and the NES. Q*bert must avoid any of the red or purple advisories to keep from losing a life. 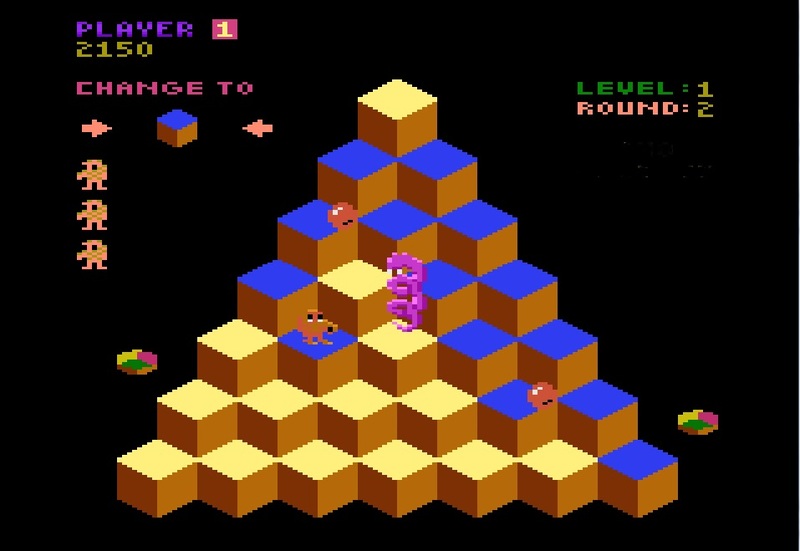 To avoid Coily, Q*bert can jump onto one of the color disks besides the pyramid of cubes and be whisked away to the top. If Coily is close enough, he will follow and jump off the cubes. Occasionally, a green ball will appear. If Q*bert contacts this ball, time will stand still, allowing Q*bert to change cube colors unimpeded. When all of the cube colors have been changed to the target color, Q*bert advances to the next level. If Q*bert loses a life, he will say something like…@#?&! The 2600 version of Q*bert was released by Parker Brothers 1983. Later on Atari released Q*bert under their own label, so you may run across this version. Both versions are exactly the same. The 2600 incarnation of Q*bert is typically highly rated and definitely plays like that arcade. As with most 2600 games of the era, the graphics are dramatically simplified with all of the sprites being mono-colored. There is no intro screen and, sometimes, it is hard to tell what level you are at. Control with the standard CX40 joystick is good and Q*bert is fun to play. With today’s technology such as the Melody board, I am wondering if someone will take advantage of 32K of memory and the ARM cpu to develop an updated 2600 version of Q*bert. This game just screams for an update…any 2600 homebrew developers listening? The 5200 version of Q*bert was also released by Parker Brothers in 1983 and, compared to the graphics of the 2600, it looks much better. The 5200 is capable of some pretty good graphics, so I wonder if the developers at Parker Brothers just settled for ‘good enough’? The game has mono-color sprites and no intro screens, but the cubes look pretty good . It also suffers from the 5200’s analog, non-self-centering joystick. The game designers tried to compensate by having you hold down the fire button in addition to moving the joystick in the direction that you want to move Q*bert. Even using a refurbished 2nd generation gold Best Electronics joystick, it was hard to control the movements and I found my Q*bert periodically committing suicide by jumping off the pyramid. If the 5200 is your only system, I am sure that you will adapt as the control isn’t impossible, just more challenging than in the 2600 version. All in all, Q*bert is easy to come by, inexpensive, and worth having in your 5200 collection. Parker Brothers never developed a 7800 version of Q*bert, so for years 7800 owners had to make do with the 2600 version. In 2007, Ken Sliders came to the rescue with his version which he has called b*nQ. B*nQ is looks and plays like the arcade version and includes intro screens and to help the player know which level they are on and what the target color is. Since only one button is required for this game, you can use a standard CX40 joystick. The 7800 version doesn’t suffer any of the control problems of the 5200 version and is a blast to play! There is absolutely nothing bad to say about b*nQ for the 7800…Ken has made this game almost arcade perfect! If you have a 7800, you need to go straight to the AtariAge store and order yourself a copy of this great game!!! Before doing the research for this post, I hadn’t really played Q*bert very much. I had purchased b*nQ about a year ago, but had played some of my other classic games more often and b*nQ was just taking up space in my collection. In the past couple of weeks, as I prepared for this post, I have almost become addicted to this game. No matter which Atari system you have, you should definitely have a copy of Q*bert in your collection. If you have multiple systems, Ken’s b*nQ is amazing and blows the others out of the water! 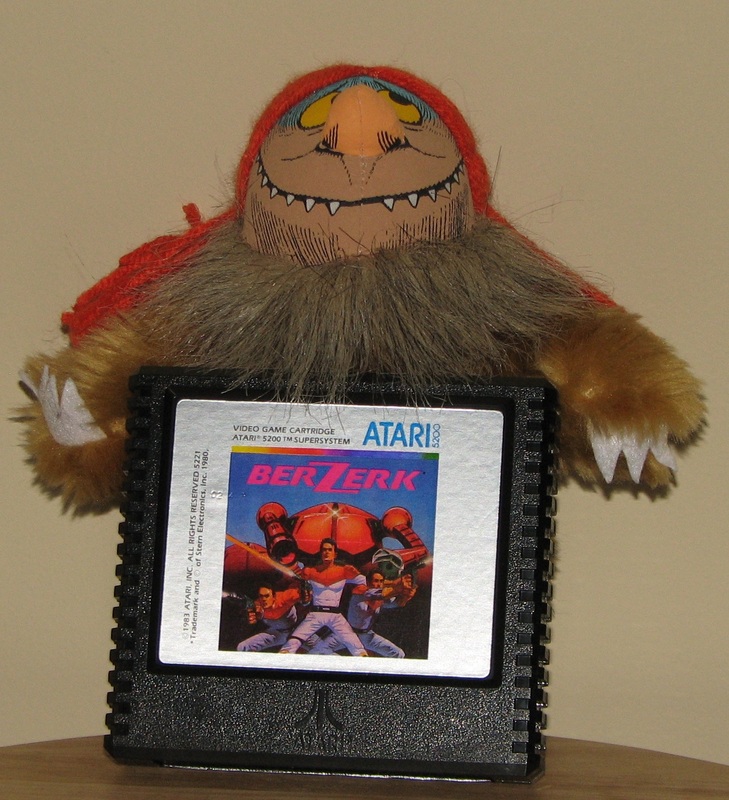 Categories: 2600, 5200, 7800, Atari, Game Reviews | Tags: 2600, 5200, 7800, Atari, Q*bert, VCS | Permalink. Joust is a 1982 video game developed by Williams Electronics. 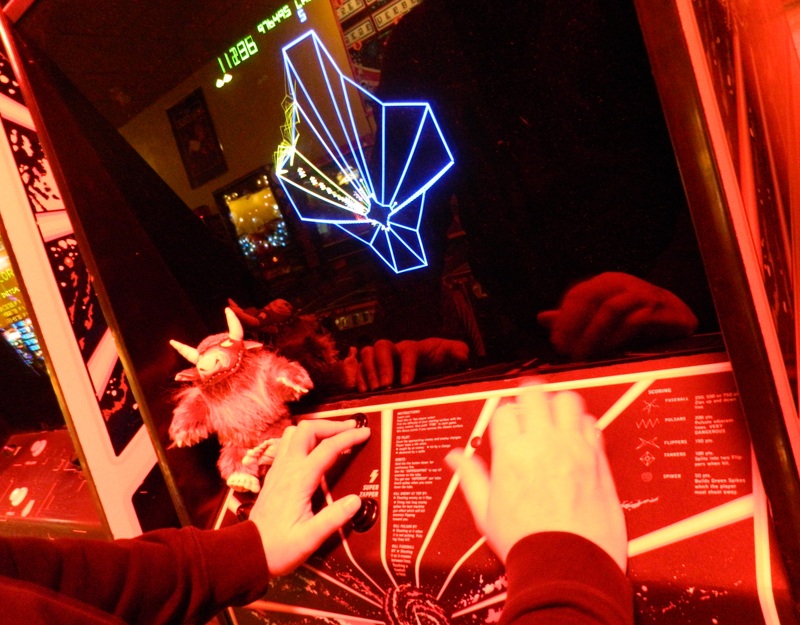 John Newcomer was the primary developer of Joust and his goal was to develop a two player arcade flying game totally different than the multitude of space themed games of the era. Joust was definitely a unique concept for the time and was a good seller for Williams with more than 26,000 arcade units sold. It was offered as both an upright cabinet and a cocktail table. The cocktail table units were unique in that both players sat on the same side. This allowed Williams to use the same ROM in both types of arcade units. The cocktail units are pretty rare as only a few hundred were manufactured. In Joust, you must ride your ostrich and compete against enemy knights riding buzzards. You can ‘kill’ an enemy knight in a joust by ramming him by being at a slightly higher flying level. When you kill an enemy knight, he will turn into an egg that you must then capture before it hatches. If the egg hatches, the knight will become the next more-challenging nemesis (a Bounder will become a Hunter, a Hunter will become a Shadow Lord and so on). After the egg hatches, a buzzard will fly out to pick up the new enemy knight. In the first two waves, the platforms at the bottom of the screen allow you to walk over the lava pits, but in later waves, the platforms will be burned away. Also, in later waves, flames will start to burn in the lava pits. Sometimes, a pterodactyl will show up, in later waves, and try to fiercely charge at you. The only way you can ‘kill’ the pterodactyl is to ram him in the mouth to disintegrate him. If you fly too close to either of the lava pits, a lava troll can reach out and grab your mount by the legs and pull you both into the lava. If this happens, you must have your mount repeatedly flap really hard to escape. Also, in later waves, the platforms will collapse and disintegrate. Occasionally, there will be an egg wave where you must collect all the enemy eggs before they hatch. Released in 1983, the 2600 version of Joust has dramatically simplified graphics, mono-color sprites, and no fire pits. Additionally, the eggs will bounce around, rather than remaining stationary. As far as the game play goes, the 2600 version is one of the better arcade ports of the era. Control with the standard CX40 joystick is good and it is fun to play. With today’s technology such as the Melody board, I am wondering if someone will take advantage of 32K of memory and the ARM cpu to develop an updated 2600 version of Joust. Even if this doesn’t happen, Joust for the 2600 is a solid port and worth having in your collection. 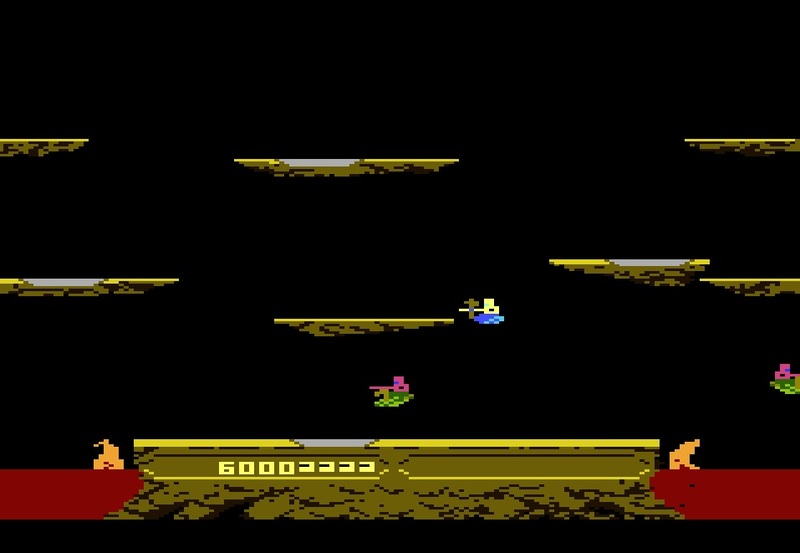 The 5200 version of Joust was also released in 1983 and, compared to the graphics of the 2600, it really looks awesome! With the exception of the simplified, mostly mono-color sprites, it is, graphically, almost a perfect arcade port. The 5200 version looks and sounds great and belongs in every 5200 collection. I will say that the game play does suffer from the 5200’s analog joystick. Even using a refurbished 2nd generation gold Best Electronics joystick, it was hard to control the movements of my ostrich. If the 5200 is your only system, I am sure that you will adapt as the control isn’t impossible, just more challenging than in the 2600 version. All in all, Joust is easy to come by and inexpensive and belongs in every 5200 collection. BTW, there is an almost identical version available for the Atari 8-bit computer line. The 7800 version of Joust was developed for the 1984 release of the console. As one of the early releases, millions of copies were manufactured and it is still possible to find sealed copies for less than $10. If you have a 7800, this game positively belongs in your collection. It is even closer to the arcade version than the 5200 version and the control is much better with a digital joystick. In fact, since only one button is required for this game, I prefer to use a standard CX40 joystick. There is absolutely nothing bad to say about Joust for the 7800…Joust, in fact, demonstrates that the 7800 was definitely a most capable home arcade system! Before doing the research for this post, I really didn’t know that much about Joust. Obviously, I was aware of the game, but can’t remember playing it in the arcade and I didn’t have a copy of the 2600 version back in the 80’s. All I can say is that I really missed out on a classic game that definitely differentiated itself from all of the space shooters of the early 80’s. 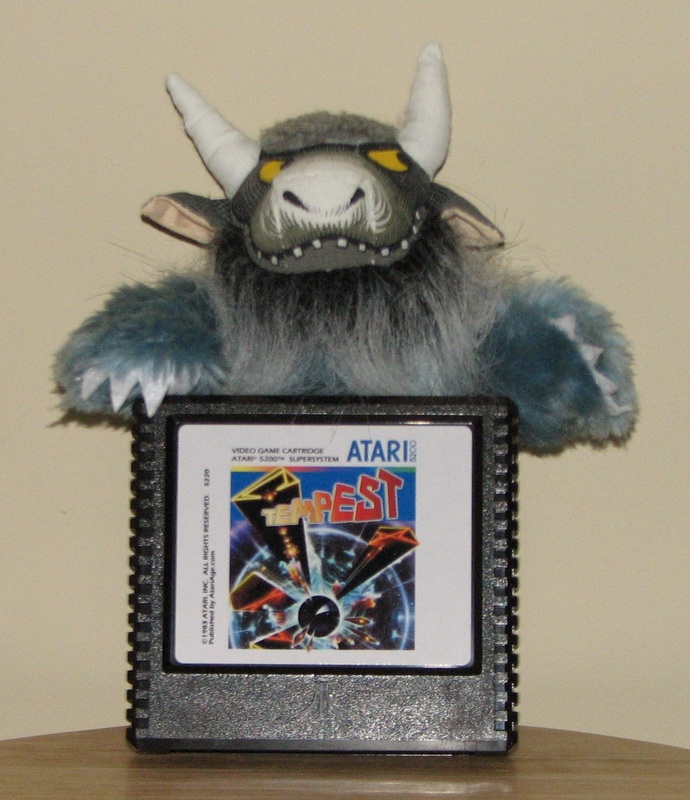 No matter which Atari system you have, you should definitely have a copy of Joust in your collection. If you have multiple systems, the 7800 version is the hands down winner! Categories: 2600, 5200, 7800, Atari, Game Reviews | Tags: 2600, 5200, 7800, Atari, Joust, VCS | Permalink. The Earwig acts the same as the scorpion in Centipede and makes the mushrooms poisonous which will cause the millipede to drop to the bottom of the screen. The Bee is the same as the flea in Centipede, dropping mushrooms in a line. The Spider behaves the same as in Centipede. More than one spider can appear at the same time on higher levels. The Inchworm slows all enemies, for a short period of time, when hit. The Beetle moves around, then climbs up, turning any mushrooms it touches into invincible flowers. When it is hit, everything on the screen moves down one row. The Dragonfly drops mushrooms while zigzagging down the screen. The Mosquito bounces off the sides of the screen as it descends. When it is hit, everything on the screen moves up one row. The DDT bomb can be blown up, destroying all enemies and mushrooms within the blast radius. Whenever the mushrooms scroll down, a new DDT bomb is added at the top of the screen. Up to four DDT bombs can be in play at one time. One of the neat things about Millipede is that it allows you to start at different point values. Thus, an experienced player can skip some of the easier levels. 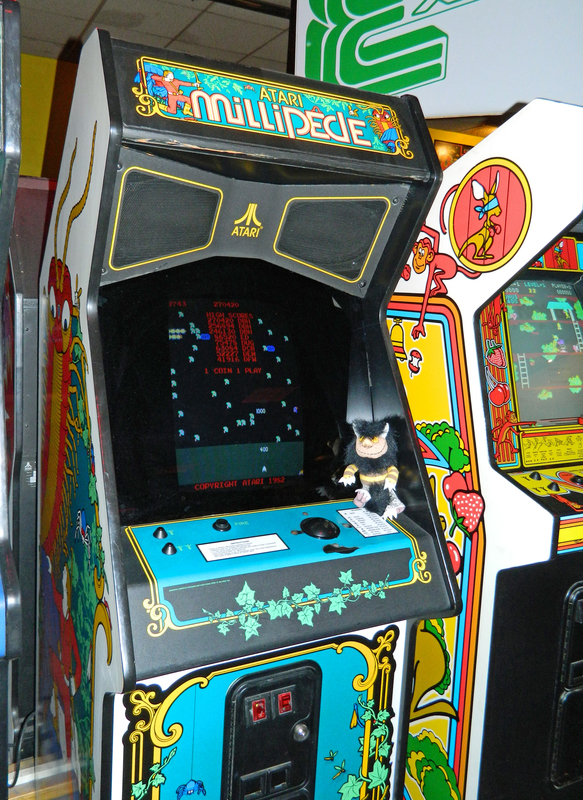 The Millipede arcade units ran off of standard Atari hardware of the time with a trackball, a fire button, a single 6502 CPU, and two Pokey chips. Millipede was a moderate hit for Atari, but did not sell as well as Centipede. Millipede was ported to a number of systems including the Atari 2600, Atari 8-bit computers, and the NES. A version was developed for the 5200, but was never officially released. Millipede for the 2600 was released in 1984 and is one of the more challenging carts to find as this was during the video game crash and not as many carts were produced. Fortunately, Millipede was included as one of the games on the Atari Flashback 2 and can also be played on a 2600 multi-cart. Like the 2600 version of Centipede, the graphics and sound are lacking, but the game play is solid, the flicker is minimal, and it includes all of the arcade elements. the 2600 version of Millipede uses a 16kb cart which is one of the largest ever used by Atari. You can read more about the 2600 version of Millipede here. A port of Millipede was developed for the 5200, but never released. The 5200 port looks and plays very close to the arcade version. The graphics and sound are outstanding and all of the enemies are well represented and it even has a cool title screen. Millipede is a blast to play with the normal 5200 controller and even more fun with the 5200 Trakball. At one time AtariAge sold some Millipede carts for the 5200, so you might be able to find one. Otherwise you will need a multi-cart in order to play Millipede for the 5200. I read a review of the 5200 version of Millipede that stated that the 5200 version was too easy. I do find Millipede a little easier to play than Centipede, but the 5200 version plays extremely close to the arcade. You can read more about the 5200 version of Millipede here. Categories: 2600, 5200, Atari, Game Reviews | Tags: 2600, 5200, Atari, Millipede, VCS | Permalink.